The darkness “Gotham” cast over Comic-Con was met with welcoming excitement. Warner Bros. Television treated its attendees to a special DC Entertainment event in Hall H last Saturday night, where the highly anticipated upcoming series “Gotham” made its world premiere. 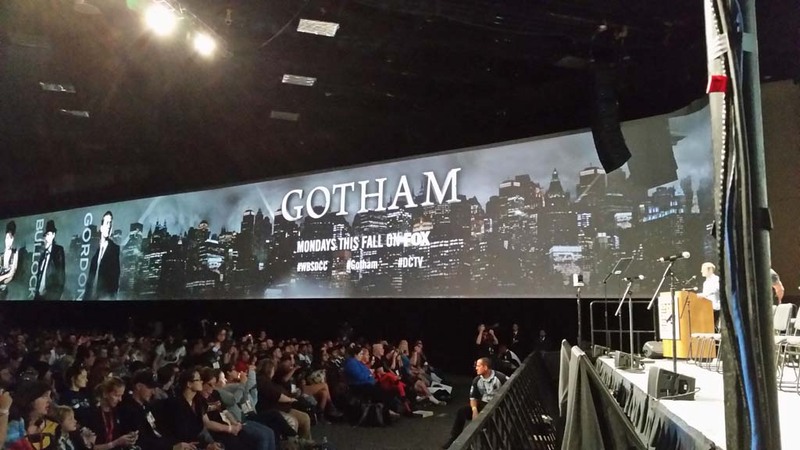 Shadows enveloped the audience as the giant screen positioned above the stage depicted the iconic comic book moment in which Bruce Wayne witnesses his parents’ untimely deaths, following that up with the introduction of the young Detective James Gordon (Ben McKenzie), who vows to catch the killer responsible. Now the parentless Bruce faces a solitary life under the care of his butler, Alfred Pennyworth. From there on out, it’s a perilous police procedural where corruption thrives and rules the city with an iron fist, and the dark, brooding atmosphere is populated with the very persons who will eventually become Batman’s famous adversaries. Gordon, who is paired up with Harvey Bullock (Donal Logue), a rough-around-the-edges cop, faces a long battle to fight in his dedication to uphold justice — which will continue to unfold in the weeks to come. Once the screening was over, several cast members and producers from the show made special panel appearances throughout the evening event to talk about the series, ranging from how the idea first formed to personal thoughts on their respective roles. For series creator Bruno Heller (“Rome,” “The Mentalist”), this origin story project was right up his alley; to him, it was only natural that the murder of the Waynes be interwoven with the young Gordon’s investigation of that case. And from that inspiration, “Gotham” emerged. “That was the beginning of the thing, and everything followed from there,” he affirmed. If the world premiere was of any indication of this approaching show’s quality, it’s one where the promising potential is the kind that we can definitely look forward to. With its serious tone and fast-paced tension in every corner and back alley, “Gotham” comes alive and lives up to its hype. In fact, it’s easy to think of this not as a television pilot but rather as a film instead, courtesy of the absorbing cinematic feel within its gritty visuals and everlasting suspense. Leading the cast is Ben McKenzie as James Gordon, whose “good cop” approach stands in direct contrast with his “bad cop” partner/mentor of sorts, Harvey Bullock, played by Donal Logue. The on-screen chemistry between the two men is concrete, providing “Gotham” with a guiding force that could prove pivotal in determining the direction of the show. In the case of Robin Lord Taylor, his twisted and brilliant portrayal of Oswald Cobblepot received thunderous applause, which can only evolve over time as the world witnesses him become the Penguin. “All I can say is that, you know, as an actor, you just want to get the best material possible. When I come to set and we look at what we’re doing for the day, and I see what’s been written…” Taylor went on to say, when asked about his inspiration for his character, “I see what’s been created and it’s all just there in front of me, I feel like I’m just stepping into something amazing. “Hopefully, this show will run until I’m 25,” commented David Mazouz, the young Bruce Wayne, who thinks he will don Batman’s cape and cowl at around that age. Camren Bicondova, described as a miniature Michelle Pfeiffer, admitted she was unaware her audition was for Selina Kyle — the future Catwoman — but nonetheless expressed excitement about what awaits her character. The seeds for the Gotham City, as well as its residents, that we know and remember have been planted, and the prospect of them growing into something wonderful seems likely. “Gotham” is scheduled to premiere Mondays starting Sept. 22 on FOX.